The movies tend to have visitors believe Thailand is all about beaches, parties and the combination of the two. Ask anyone who’s actually travelled to the country, however, and they’ll tell you the most quintessentially Thai experience might just be strolling down a market! In fact, heading down to the ‘talad’ is a vital part of everyday life for millions of locals who just aren’t sold on the idea of storing food at home: Thais like their ingredients as fresh as possible. While most tourists flock to Bangkok’s much-hyped Chatuchak weekend market and Chiang Mai’s busy walking street, a number of lesser-known options are no less exciting to visit – in fact, the opposite might be the case! From flowers and delicatessen to those eyebrow-raising trinkets you’ll only ever see in Thailand, you’ll find all you’ve ever wanted (and then some more) at the below. Despite appearing in guidebooks, Thailand’s biggest flower exchange near the Chao Phraya remains a local affair. 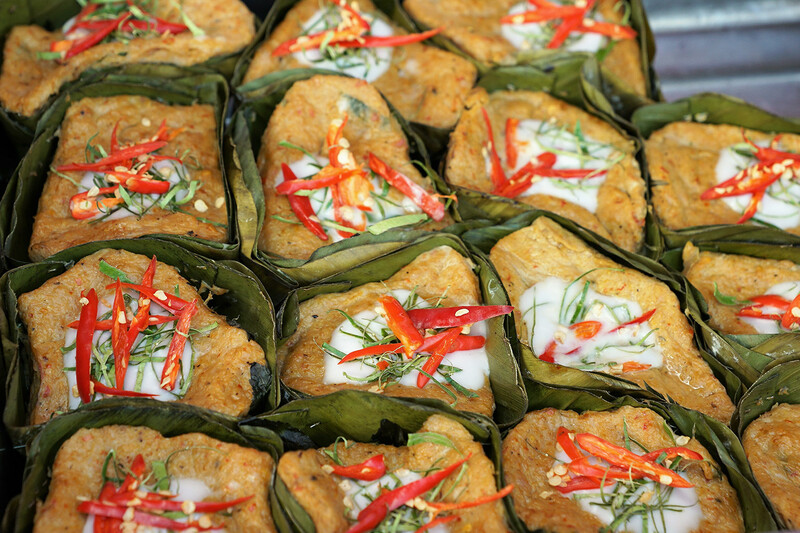 Visiting Pak Khlong means stepping into history; the market has been around since the 18th century! Once Bangkok’s prime destination to buy seafood, the talad was later transformed (who wouldn’t prefer the fragrance of flowers to the smell of fish wafting through the capital?). On an average visit, you’ll come across local plants as well as imported varieties from far-flung corners of the world. Amazingly, the market is open around the clock and visitors heading here at 3 in the morning rejoice at the sight of traders unloading their trucks and boats. Looking for a fun way to end a night on Silom’s Soi 4? Hop on a tuk-tuk to Pak Khlong and witness rainbow-coloured flowers cascading into the market’s vast spaces – what could be more memorable? Phuket’s streets have more markets than its beaches have grains of sand. Hence, authentic fare can be hard to find. Removed from tourist-heavy Patong and Karon, Phuket old town is home to one of Thailand’s most eclectic walking streets: every Sunday evening, Thalad road turns into a 400-metre long spectacle uniting locals and tourists in the spirit of shopping and (of course) snacking! Sip on some freshly squeezed sugar cane juice while browsing through locally made objet d’arts and quirky souvenirs (looking for a wooden phone case, anyone?). One thing not on offer here is counterfeit fashion so sweep up your Prado purses and Goocci belts elsewhere (or don’t). Other than the Sino-Portuguese architecture of its adjacent buildings, we love Lard Yai’s many street artists: dancers, singers and live painters all gather here for a huge extravaganza each Sunday night! This Northern market might appear last on our list but in many ways, it takes the top spot on a winners’ rostrum. For one, the talad is the most hidden of all gems featured, despite being in plain sight. Located in central Chiang Rai, Tesaban market goes by several names (though hotel receptionists know what you mean by ‘the big talad’!). Vendors trade inside an expansive, mazy hall as well as on its adjoining pavements where hill-tribe farmers from outlying villages proudly arrange their organic produce on battered tarpaulins – this place has barely changed over the years and still offers sights otherwise reserved for nearby Laos and Myanmar. Those with a sweet tooth are in for a special treat as Northern Thailand’s hills offer ideal conditions for rare types of plants to prosper: we’ve tried fruits here we’ve not seen anywhere else in Asia!